Shaun of the Dead has a lot to answer for, culturally speaking, but every now and then it births a shambling, mumbling, flesh-starved horror it should be proud of. Among them is DDB New York's "Zombies" ad for the New York Lottery Mega Millions, which will run in cinemas starting today (spreading soon to TV), and features a trio of apocalypse survivors preparing to fend off a horde of restless undead inside a storefront, only to be saved at the last minute by an announcement that the lottery jackpot is now at "millions and millions of dollars!" 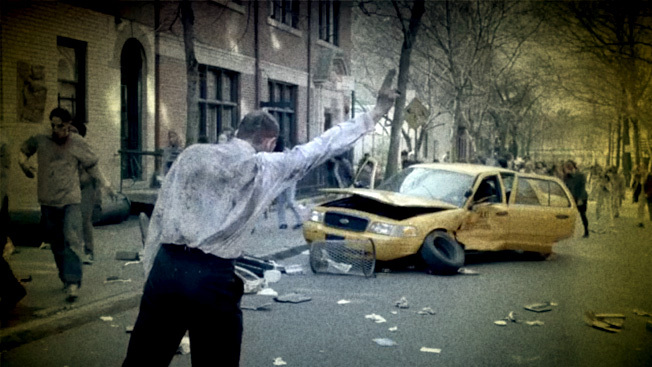 A few questions about this spot: Assuming one of the zombies wins the lottery, what will he buy with the proceeds? Answer: Brains. Why are the people inside the Brooklyn laundromat facing the plate glass window, rather than hiding deeper inside the store? Answer: Brains. Why is the government taking valuable zombie-killing time out of a hopefully very busy schedule to announce the lottery jackpot over what must be the only remaining television station? Answer: Braaaaaaaains. All in all, a well-directed spot with an instantly recognizable theme at least one huge, unintended truth, namely that lottery tickets are for people who really need brains. Yes, all right, fine, I've played the lottery, too.